Mail Checker Minus; Or Why Are You Maintaining a Chrome Extension? Update Feb 3rd 2011: I am no longer maintaining the Mail Checker Minus extension. I recommend switching over to Jason Savard‘s Checker Plus For Gmail. He’s already done a good bit of work cleaning up code and adding new features. For those of you happy with the extension as is, I will continue to make it available via the Chrome Web Store, but please note that I will not be fixing bugs or supporting the extension. 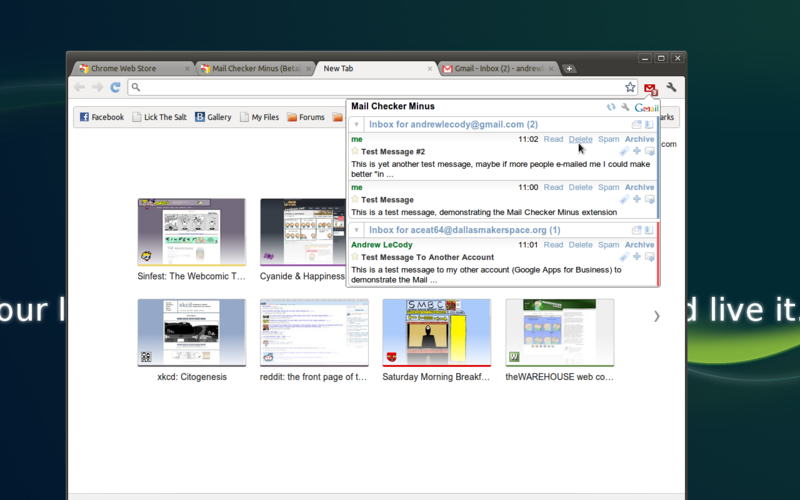 It’s fairly likely that you found this site because of the Google Chrome Extension I now maintain, Mail Checker Minus. That’s a pretty good assumption since it’s fairly popular and links here. For the two people who somehow found my site and don’t know about Mail Checker Minus, it is (in my opinion) one of the most useful plugins for Chrome. It allows you to see the number of unread mails for Gmail at a glance, preview them, and even take actions on them. I’m not tooting my own horn here, I didn’t write Mail Checker Minus, I forked it from an extension called “Mail Checker Plus for Google Mail”. I loved Mail Checker Plus but sometime earlier this year the developer decided to modify the extension so that it injected ads into certain websites. Obviously that is a pretty awful thing to do, from what I can tell Google quickly removed Mail Checker Plus from the Chrome Web Store. I first noticed that the extension was gone when I installed Chrome on a new computer and the only extension that didn’t auto install (sync everything is AWESOME) was Mail Checker Plus. After a bit of searching I discovered that my favorite extension was dead and gone, but the source code for it was on Github and released under the GPL. Before I even had a chance to think about it I had clicked “fork” on Github. I cloned the repo to my local computer, installed the plugin and promptly went back to my normal work. A few days later I decided, mostly to make my life easier (I really like being able to sync everything), to rename the extension to Mail Checker Minus and put in the Chrome Web Store. I figured no one would ever see it, but I didn’t really care so long as the extension kept working for me. As it turns out there were quite a few people who installed the new extension, as of this writing there are 3,677 users and the extension is rated 5 stars. I think that is pretty awesome, so for now I guess I will keep on maintaining the Mail Checker Minus extension. I would like to thank everyone who has or will help my favorite extension continue to grow and survive. P.S. If you think you can make a better extension, DO IT, please. Hey, thanks a million for forking the extension and creating Mail Checker Minus. Like you, I found Mail Checker Plus to be incredibly useful, and was kind of surprised when it disappeared. Now I know why that happened. One question – the latest version now requires access to [my] data on all websites, bookmarks, tabs, and browsing history. What’s up with that? Hi. .9 did not work in Chrome dev channel, but .10 is working really fine. I appreciate your taking over this great extension. Why Bookmarks? Had to un-install it. it was GREAT until yesterday. Now looking for something similar (may be a little less innovative.. I can live with that, but all my bookmarks??) no way. I’m sorry you feel that way. You do realize this extension has always required “Your data on all websites” and “Your tabs and browsing activity”, right? This is primarily so that mailto: links can be rewritten to use gmail for sending mail. I’m currently testing to see if the bookmark data is required. The pull request for fixing a bug that prevented users of Chrome 17+ was fixed by the patch that included the bookmark data permission options, so in the interest of having an extension that works for a even more users I pushed the changes on through. I honestly didn’t realize people would have an issue with it. If you find a better extension, let me know. Will you also be making a Beta version like the plus one did? Thanks you SO MUCH! I’ve been dying over here without Mail Checker Plus, and I couldn’t figure out what happened to it. I thought Google got jealous and pulled it or something. I was REALLY missing the ability to read the e-mail by just clicking the icon. So thanks for doing this! Great work with this extension! Please could you improve the Italian translation? Thanks a lot! do you have any plans to be competing with jasonsavard.com’s checker plus for gmail? I really enjoy this extension and it’s a huge time saver. But I have a request. Could you put together some setup instructions? The problem I’m having is that I cannot for the life of me figure out how to get the extension to check multiple email accounts at once (I’m assuming that’s what is meant by “Support for multiple accounts.” I have two main Gmail accounts (one is through Google Apps as it’s a personal domain) that I use regularly and would like to check both. I’ve set up my personal domain email that I have through Google Apps, but now I can’t check the other one. I’m assuming it’s possible, but I have no idea how to it unless I’m overlooking the obvious. It’s a great extension so far anyway, and I appreciate your work. Keep it up! Best extension for checking gmail ever, since it uses and sees already signed-up multiple sessions. The logic and ability to read, star, delete from popup box is something others forget to offer in it’s entirety. One tiny detail remains bad. When I log into the accounts it does not always see the accounts, but I have to go into the options and do “SAVE AND RELOAD” for it to see it. Maybe to add that “RELOAD” option in the dropdown menu or make it work in that particular case. Thank you very very much, you saved me a bunch of time, stress and energy. Just thought you should know: I found your site through http://lickthesalt.com/2009/04/19/tweaking-nagios-for-performance/ via google search on random search. …and thusly had no knowledge of this wondrous extension :P.
Jason Savard‘s Checker Plus For Gmail is much better than what I’ve been using. Thanks for the link.